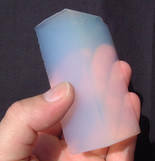 Aerogel as a low-density solid-state material derived from gel in which the liquid component of the gel has been replaced with gas. The result is an extremely low density solid with several remarkable properties, most notably its effectiveness as an insulator. It is nicknamed frozen smoke, solid smoke or blue smoke due to its semi-transparent nature and the way light scatters in the material; however it feels like styrofoam to the touch. NASA used aerogel to trap space dust particles aboard the Stardust spacecraft. The particles vaporize on impact with solids and pass through gases, but can be trapped in aerogels. NASA also used aerogel for thermal insulation of the Mars Rover and space suits. Above image on is the Nasa stardust spacecraft on which the Aerogel was used by Nasa.